The last decade has witnessed an exponential expansion of environmental surveillance (ES) of poliovirus in sewage samples in the World Health Organization (WHO) South-East Asia Region. This has grown from only three sites in Mumbai, India in 2001 to 56 sites in 2017 in Bangladesh, India, Indonesia, Myanmar, Nepal and Thailand. ES is critical to the region in providing evidence of silent transmission of vaccine-derived poliovirus and Sabin-like poliovirus type 2 – especially since the global “switch” to cease use of oral polio vaccine type 2 – and for monitoring the effectiveness of containment activities. This targeted expansion of ES to supplement surveillance for acute flaccid paralysis (AFP) required quality assurance in ES procedures, improvements in the sensitivity of the laboratory-based surveillance system, and establishment of real-time data analysis for evidence-based programmes. ES in the region has provided documentary evidence for the absence of indigenous wild poliovirus in circulation and no importations via international travellers. Post-switch, while no vaccine-derived poliovirus was detected from AFP cases, ES identified five ambiguous vaccine-derived polioviruses in 2016 and early 2017, with no evidence of circulation. Future challenges include monitoring for vaccine-derived poliovirus strains shed for a prolonged time by immunodeficient individuals, and expanding ES to areas lacking sewage networks. To maintain the polio-free status of the WHO South-East Asia Region and achieve a world free of poliomyelitis, critical evaluation of immunization coverage, continued performance of surveillance for acute flaccid paralysis, and enhanced analysis of sewage samples to detect any breach in containment are essential. The World Health Organization (WHO) South-East Asia Region was certified as being polio free on 27 March 2014, 3 years after the last case due to wild poliovirus (WPV) was reported in the region. Along with maintaining polio-free status, the region has made unprecedented progress towards the global goal of polio eradication, by sustaining high overall population immunity against polio, surveillance of certification-standard acute flaccid paralysis (AFP), and outbreak response preparedness. AFP surveillance in children under 15 years of age remains the gold standard for polio surveillance, and in selected locations it is supplemented with environmental surveillance (ES). ES for poliovirus is the monitoring of poliovirus transmission in human populations by examining environmental specimens that are potentially contaminated by human faeces. The rationale for testing sewage for poliovirus is that, once infected with poliovirus, individuals shed large amounts of the virus in their faeces for several weeks, irrespective of whether they have symptoms. Poliovirus infection may be symptomatic in only 0.1% to 1% of infected individuals, or even less in partially immune groups. Testing of stool and sewage samples includes genomic sequencing to characterize poliovirus isolates; the results are used to map poliovirus transmission and identify gaps in AFP surveillance. Overall immunization rates may conceal unvaccinated individuals, who are susceptible to infections on coming into contact with the circulating poliovirus strains, and hence pose a continued risk of poliovirus spread. Thus, early detection of poliovirus circulation is critical for an effective response to outbreaks and to prevent further spread of the virus. The aim of this paper is to assess the supplementary role of ES in the ongoing AFP surveillance and highlight the current challenges in expansion of ES in the WHO South-East Asia Region. In the WHO South-East Asia Region, ES has been based on meticulous risk analysis, taking into consideration the chances of importations; past history of poliovirus circulation; identification of high-risk areas of low routine immunization coverage; and environmental and social factors, including the demographic profile. In India, ES was initiated in 2001 with sewage sampling conducted weekly from three sites in Mumbai, Maharashtra. Nearly a decade later in 2010, five ES sites were established in New Delhi. Since 2010, the number of sewage sampling sites in India has more than quadrupled, from eight sites in one state and one union territory in 2010 to 42 sites in seven states and one union territory in 2017. In addition to India, ES has been ongoing for more than a decade in Indonesia. This started in 2004, as a part of a feasibility study of inactivated poliovirus vaccine (IPV) at one site in Yogyakarta. Since 2016, the data from the Yogyakarta site have been shared with programme experts for strengthening the surveillance of poliovirus in the region. The National Polio Laboratory, located at Bandung, conducts viral isolation, intratypic differentiation and genomic sequencing of poliovirus isolates from sewage samples collected from both Bandung and Yogyakarta. The Bandung laboratory also supports the genetic analysis of poliovirus isolates from ES samples processed in polio laboratories at Surabaya and Jakarta. Focused expansion of ES in Indonesia was seen with establishment of sewage sampling sites, one each at Jakarta (2016) and Surabaya (2017), and supported by the Regional Polio Laboratory Network of Indonesia. In Bangladesh, ES was started in September 2015. The two sewage sampling sites at Dhaka and Gazipur were selected for monitoring susceptible populations, after careful analysis of wastewater flow routes in areas where AFP surveillance was suboptimal, silent virus circulation was suspected, and there was a high risk of importations, specifically during the large religious mass gatherings that occur annually in Dhaka. Myanmar established ES during November 2017, with sampling sites in Yangon Region and Rakhine State to strengthen the ongoing poliovirus surveillance activities. There was a need to establish ES subsequent to an outbreak of circulating vaccine-derived poliovirus (cVDPV) type 2 in 2015, to provide concrete documentary evidence of no poliovirus circulation in the community. The setting up of a sewage concentration laboratory in Nepal during 2017, led to establishment of an innovative mechanism to expand ES in those Member States that do not have facilities for detection of poliovirus within the country. After initial concentration using the two-phase separation method, the sewage collected from three sites in Kathmandu district in Nepal is shipped to the regional reference laboratory in Bangkok, Thailand, for viral isolation and analysis. Since November 2016, ES in Thailand has been conducted at two sites, one each at Din Daeng district, Bangkok, and Samut Sakhon Province. Inner Bangkok is a high-volume traveller zone, so catchment areas are used to ensure high vigilance for any poliovirus importations into the country, which is necessary for maintaining the country’s polio-free status. The Samut Sakhon site has a large number of labour immigrants from neighbouring Myanmar. Information regarding the immune status of the migratory population is usually insufficient and so initiation of ES led to enhanced confidence in the ability of the existing system of surveillance to detect any poliovirus importation/circulation in the catchment area. The last decade has witnessed an exponential expansion of ES of poliovirus in sewage samples in the WHO South-East Asia Region, from only three sites in Mumbai, India, in 2001, to 56 sites in 2017, located in six Member States, namely Bangladesh, India, Indonesia, Myanmar, Nepal and Thailand. This strategic expansion of ES is encouraging and indicates that the region is preparing for the post-certification era and contributing to building a polio-free world at a commendable pace. Laboratory support for ES was established by building on the capacity of selected polio laboratories from among the pre-existing Global Polio Laboratory Network of 16 laboratories in the region. 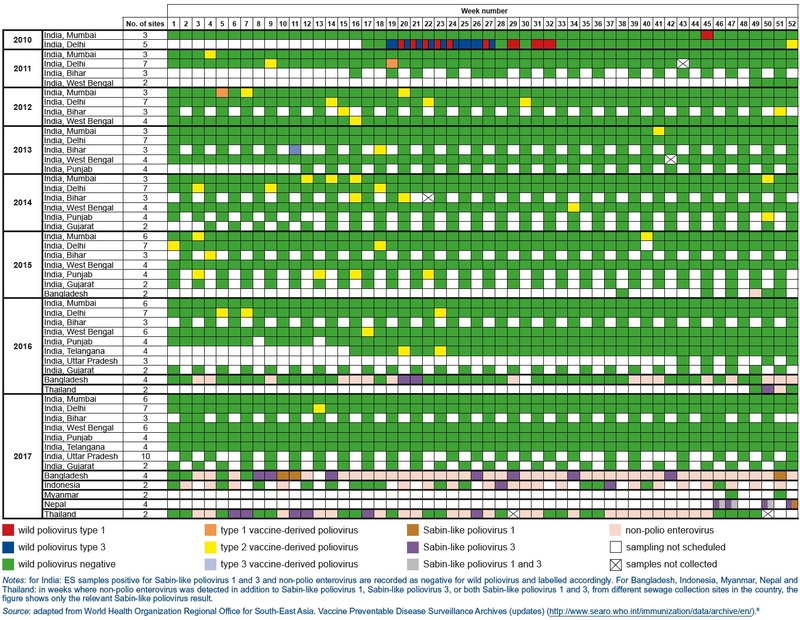 The laboratories support viral isolation, intratypic differentiation and genomic sequencing of poliovirus isolates from sewage sludge, and in addition there are two laboratories in India (Hyderabad and Patna) and one in Nepal performing sewage concentration only, as shown in [Table 1]. All countries in the WHO South-East Asia Region established case-based AFP surveillance in 1997. More than 50 000 sites are currently participating in the reporting of AFP cases and the surveillance system is instrumental in generating real-time, credible data that help the programme to prioritize and guide immunization activities and future strategies. The non-polio AFP rate in the WHO South-East Asia Region in 2017 was 6.29 per 100 000 population under 15 years of age, which exceeds the globally recommended target of 2 per 100 000. A total of 2567 sewage samples were collected from the 56 sewage sampling sites in the region during 2016–2017 and processed at laboratories supporting ES (see [Table 2] and [Figure 1]). Wild poliovirus types 2 and 3 (WPV2 and WPV3) have been isolated from sewage samples since 2001 in India. A gradual decline in isolation frequency and, finally, complete absence of WPV in sewage samples has been observed from the ES data in the region. During 2010, the last WPV1 and WPV3 strains were detected in sewage samples, while there was no WPV2 recovered even in sewage samples during 2010, indicating that there was no circulation of WPV2 in the region (see [Figure 1]). 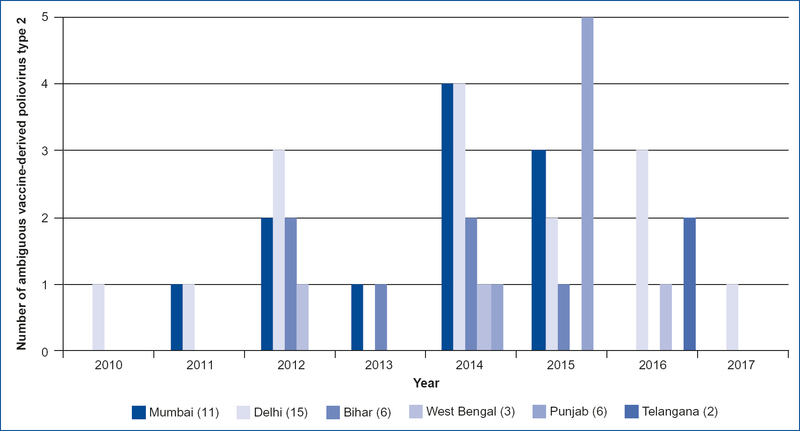 Since 2010, the sewage samples have detected 43 instances of ambiguous vaccine-derived poliovirus (aVDPV) type 2 in the region – all in India (see [Figure 2]). Furthermore, only two occurrences of aVDPV type 1 and a single case of aVDPV type 3 have been reported from India via ES during the last decade in the entire WHO South-East Asia Region. In April 2016, there was a globally synchronized “switch” from trivalent to bivalent oral polio vaccine. Following withdrawal of the oral polio vaccine type 2 strain (OPV2), ES was used to closely monitor poliovirus type 2 in sewage samples. While no VDPV type 2 was detected in AFP cases, sewage specimens indicated ambiguous vaccine-derived poliovirus type 2 (aVDPV2) in the region. A total of seven aVDPV2 cases were detected in sewage samples from India – Telangana (2), West Bengal (1) and Delhi (4) – between April 2016 and December 2017 (see [Figure 2]). All VDPVs detected by ES were adequately investigated to establish genetic linkages, and no circulation of poliovirus in the region was evident. During the pre-switch period (January to April 2016), Sabin-like poliovirus type 2 (Sabin-like PV2) was detected through both AFP and ES; after the switch, Sabin-like PV2 was reported primarily in ES samples. A total of 134 instances of Sabin-like PV2 were reported from the region during 2016, post switch. The ES reported 81/134 Sabin-like PV2 isolates from April to December 2016 during laboratory investigations. The stool samples from 49 AFP cases isolated Sabin-like PV2 during April to May 2016. Even though detection of Sabin-like PV2 in stool samples from AFP cases was confined to only 1 month post switch, the detection in sewage specimens continued for almost 10 months following the withdrawal of trivalent oral polio vaccine. The ES samples collected from two sites in India between August and December 2016 reported Sabin-like PV2 with zero nucleotide changes, thus indicating recent introduction of the poliovirus. The vaccine-derived polioviruses (VDPVs) pose a high risk for re-emergence of polio. While no VDPV has been detected from AFP cases in the region following the switch, sewage samples tested from India confirmed four aVDPVs after April 2016 and a single aVDPV in March 2017. All poliovirus sequences from VDPVs detected in ES were analysed and determined to be not genetically linked, indicating that there was no evidence of circulation in the region. Detailed subnational risk assessments and a rapid surveillance review confirmed that population immunity against poliovirus type 2 was very high and did not warrant the use of monovalent OPV2; however, a mop-up response with a fractional dose of IPV was conducted in one of the areas concerned (Hyderabad), to mitigate the risk of spread of the VDPV2 during the third quarter of 2016., The VDPVs detected in sewage confirm that ES is a very sensitive tool for monitoring circulation of poliovirus strains in the community. Furthermore, the possibility of poliovirus circulation in populations using only IPV remains, as described in Israel for WPV, thus representing a possible source of polio re-emergence. Poliomyelitis has been a notifiable disease in Israel since 1950 and the last case of WPV1 was reported during 1988. Routine ES detected the importation of WPV1 into Israel in 2013 and sustained transmission that could mainly be explained by exclusive immunization of all birth cohorts since 2005 with a routine IPV-only regimen. The fact that no cases of paralytic poliomyelitis occurred is most likely attributable to the high IPV coverage of the cohorts of children aged 0–10 years, combined with early warning provided by ES and the resulting reponse. In situations where IPV supplies are interrupted and vaccine coverage is suboptimal, it is imperative to identify the immunodeficiency-associated vaccine-derived poliovirus (iVDPV) strains in circulation. Immunocompetent individuals excrete polio vaccine viruses for up to 2–3 months, whereas prolonged excretion of VDPV for 6 months up to more than 10 years has been found in persons with primary humoral immunodeficiency. VDPV strains from immunodeficient individuals (iVDPVs) have not yet been implicated in outbreaks in the same way that cVDPVs have, although globally there has been some evidence of local virus transmission from patients to unvaccinated children. Risks posed by iVDPV strains in the region remain unknown because currently there is no organized way to ascertain the number of immunodeficient, long-term iVDPV excretors in the region. Thus, further monitoring is warranted to secure eradication of poliovirus, including iVDPVs. Provided antibody titres and immunization coverage are maintained, it is likely that populations will remain protected against paralytic disease. Over time, as OPV2-naïve cohorts accumulate, the risk of generating new cVDPVs will increase, following exposure to (i) immunodeficient, long-term iVDPVexcretors; (ii) virus inadvertently released from a manufacturing facility/laboratory; or (iii) monovalent OPV2 use in response to outbreak. Thus, to prevent paralysis caused by VDPVs, it is critical to establish the absence of vaccine viruses from the environment. Hence, there is an urgent need to systematically enhance the quality of surveillance and closely track any new circulation of poliovirus type 2, to safeguard against potential widespread transmission. Currently, the roadmap for targeted ES expansion is based on risk analysis, at both national and subnational level in the region. The risk status is dynamic and dependent upon changes in virus epidemiology, immunization coverage and surveillance status, making it a daunting task to identify an appropriate site for sewage sampling. ES expansion at subnational levels is rife with challenges, particularly in remote areas with open defecation, pit latrines, septic tanks and an absence of well-established sewage systems. The mapping of sewage lines and understanding the sewage systems require close coordination with departments beyond health, such as departments of public work; water and sanitation; industrial waste management; and the environment. This calls for closer collaboration and fostering of synergies among various agencies beyond health, to maintain polio-free status in the region. The isolation of poliovirus from sewage samples is complex, as the odds of having various serotypes mixed in a given sample are high. It is critical to augment the capacity of laboratories, to ensure that optimal sensitivity in detecting polioviruses from sewage specimens is sustained. The strong programmatic performances for polio eradication have been backed by data from AFP surveillance. Data quality for ES poses a challenge, owing to inconsistent and incomplete data from all administrative levels, and the rapid evolution of protocols for ES sample processing. Most laboratories have adopted the latest two-phase concentration method, though some, along with adopting new techniques, are still following methods that have been in use for a long time, to allow comparative analysis of results. For real-time, data-based informed decisions, it is necessary to establish robust data analysis at regional, national and subnational level, with widespread sharing of results, and increased capacity at all levels for data management. To ensure the highest standards in laboratory-supported ES, it is of paramount importance to delineate indicators for ascertaining quality in ES procedures. An accreditation checklist has been finalized and piloted by the WHO Global Polio Laboratory Network. There is an urgent need to develop appropriate proficiency test panels for implementing quality control measures. The containment requirements of the third edition of the WHO Global Action Plan to minimize poliovirus facility-associated risk after type-specific eradication of wild polioviruses and sequential cessation of oral polio vaccine use (GAPIII) add further complexities to handling potentially infectious material, especially sewage specimens at the poliovirus-non-essential laboratory facilities, which process new specimens that contain, or might contain, polioviruses, and adopt a non-retention policy. There is a strong need to assess and minimize the laboratory-associated risk in compliance with containment practices at laboratories exclusively supporting concentration of sewage samples, because these laboratories in the region are currently not included in the WHO-accredited Regional Polio Laboratory Network. As progress is made and moves closer to eradication, ES assumes higher significance and it is very important to overcome the challenges in strengthening and expanding ES in the region. Globally, polio eradication is currently at a critical stage, so continued and sustained efforts are ongoing in the region to maintain and further improve the sensitivity of the surveillance system. As we move closer to a polio-free world, sensitive AFP surveillance becomes increasingly critical and, as the number of reported polio cases declines, ES will continue to be an important supplement to AFP surveillance. Maintenance of the region’s polio-free status requires promotion of: (i) expansion of ES to identify early indication of new importations into the region; (ii) expansion in high-risk areas where populations are at a particular risk of VDPV emergence; (iii) documentation of the elimination of Sabin-like viruses following the sequential withdrawal of polio vaccine types 1 and 3 in the near future; (iv) supportive documentation for the certification of polio eradication; and (v) in view of the increasing importance of effective ES during the post-certification period, strengthening of sustainable laboratory resources and maintenance of specialized laboratory skills to optimize sensitivity in detection from sewage samples. Acknowledgements: We thank Mr Deepak Dhongde, data management associate, WHO Regional Office for South-East Asia, and experts from the Regional Polio Laboratory Network, for their contribution to the programme and help in guiding the process of regional polio-eradication activities. Authorship: AG wrote the article and subsequent revisions, SP reviewed sections relevant to the Regional Laboratory Network, SB reviewed the overall paper. Polio-free certification of the WHO South-East Asia Region, March 2014. Wkly Epidemiol Rec. 2014;89(44):500–504 (http://www.who.int/wer/2014/wer8944.pdf?ua=1, accessed 22 May 2018). Global Polio Eradication Initiative. Polio eradication and endgame strategic plan 2013–2018. Geneva: World Health Organization; 2013 (WHO/POLIO/13.02; http://polioeradication.org/wp-content/uploads/2016/07/PEESP_EN_A4.pdf, accessed 21 May 2018). Global Polio Eradication Initiative. Guidelines on environmental surveillance for detection of polioviruses Geneva: World Health Organization; 2015 (http://polioeradication.org/wp-content/uploads/2016/07/GPLN_GuidelinesES_April2015.pdf, accessed 22 May 2018). Lodder WJ, Buisman AM, Rutjes SA, Heijne JC, Teunis PF, de Roda Husman AM. Feasibility of quantitative environmental surveillance in poliovirus eradication strategies. Appl Environ Microbiol. 2012;78(11): 3800–5. doi:10.1128/AEM.07972-11. Wahjuhono G, Revolusiana, Widhiastuti D, Sundoro J, Mardani T, Ratih WU et al. Switch from oral to inactivated poliovirus vaccine in Yogyakarta Province, Indonesia: summary of coverage, immunity, and environmental surveillance. J Infect Dis. 2014;210 Suppl. 1:S347–52. doi:10.1093/infdis/jiu060. External second assessment: circulating vaccine derived poliovirus type 2 (cVDPV2) outbreak response. Myanmar, 25 September–8 October 2016. New Delhi: World Health Organization Regional Office for South-East Asia; 2016 (SEA-Immun-106; http://www.searo.who.int/immunization/documents/obra_ii_myanmar.pdf?ua=1, accessed 21 May 2018). World Health Organization Regional Office for South-East Asia. Immunization. Vaccine preventable disease (VPD) surveillance data (http://www.searo.who.int/immunization/data/en/, accessed 1 June 2018). World Health Organization Regional Office for South-East Asia. Immunization. Vaccine Preventable Disease Surveillance Archives (updates). (http://www.searo.who.int/immunization/data/archive/en/, accessed 29 July 2018). Bahl S, Hasman A, Eltayeb AO, Noble DJ, Thapa A. The switch from trivalent to bivalent oral poliovirus vaccine in the South-East Asia Region. J Infect Dis. 2017;216(Suppl. 1):S94–100. doi:10.1093/infdis/jiw602. El Bassioni L, Barakat I, Nasr E, de Gourville EM, Hovi T, Blomqvist S et al. Prolonged detection of indigenous wild polioviruses in sewage from communities in Egypt. Am J Epidemiol. 2003;158(8):807–15. doi:10.1093/aje/kwg202. Pöyry T, Stenvik M, Hovi T. Viruses in sewage waters during and after a poliomyelitis outbreak and subsequent nationwide oral poliovirus vaccination campaign in Finland. Appl Environ Microbiol. 1988;54(2):371–4. Yoshida H, Horie H, Matsuura K, Kitamura T, Hashizume S, Miyamura T. Prevalence of vaccine-derived polioviruses in the environment. J Gen Virol. 2002;83(Pt 5):1107–11. doi:10.1099/0022-1317-83-5-1107. Deshpande JM, Shetty SJ, Siddiqui ZA. Environmental surveillance system to track wild poliovirus transmission. Appl Environ Microbiol. 2003;69(5):2919–27. doi:10.1128/AEM.69.5.2919-2927.2003. Cowger TL, Burns CC, Sharif S, Gary HE Jr, Iber J, Henderson E et al. The role of supplementary environmental surveillance to complement acute flaccid paralysis surveillance for wild poliovirus in Pakistan – 2011–2013. PLoS One. 2017;12(7):e0180608. doi:10.1371/journal.pone.0180608. Asghar H, Diop OM, Weldegebriel G, Malik F, Shetty S, El Bassioni L et al. Environmental surveillance for polioviruses in the Global Polio Eradication Initiative. J Infect Dis. 2014;210(Suppl. 1):S294–303. doi:10.1093/infdis/jiu384. Bahl S, Verma H, Bhatnagar P, Haldar P, Satapathy A, Kumar KNA. Fractional-Dose Inactivated Poliovirus Vaccine Immunization Campaign –Telangana State, India, June 2016. MMWR Morb Mortal Wkly Rep. 2016;26;65(33):859–63. doi:10.15585/mmwr.mm6533a5. Diop OM, Asghar H, Gavrilin E, Moeletsi NG, Benito GR, Paladin F et al. Virologic monitoring of poliovirus type 2 after oral poliovirus vaccine type 2 withdrawal in April 2016 – worldwide, 2016–2017. MMWR Morb Mortal Wkly Rep. 2017;66(20):538–42. doi:10.15585/mmwr.mm6620a. Moran-Gilad J, Kaliner E, Gdalevich M, Grotto I. Public health response to the silent reintroduction of wild poliovirus to Israel, 2013–2014. Clin Microbiol Infect. 2016;22 Suppl. 5:S140–S145. doi:10.1016/j.cmi.2016.06.018. Dunn G, Klapsa D, Wilton T, Stone L, Minor PD, Martin J. Twenty-eight years of poliovirus replication in an immunodeficient individual: impact on the global polio eradication Initiative.PLoS Pathog. 2015;11(8):e1005114. doi:10.1371/journal.ppat.1005114.